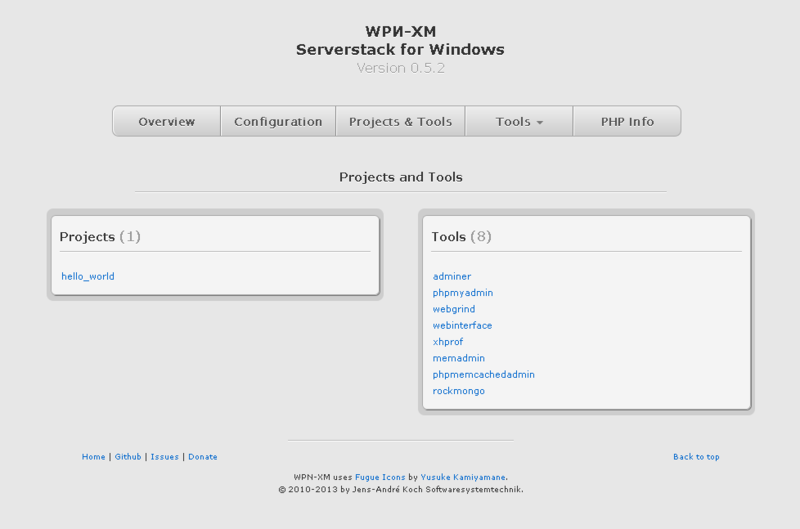 WPИ-XM is an open source web server solution stack for professional PHP development on the Windows platform. In order to develop PHP web applications, a programmer needs to use an operating system, web server, database and PHP as programming language. If your operating system is Windows, then this solution stack might be the right choice for you. WPИ-XM is a selection of software components bundled and preconfigured in an easy to install software distribution to create a professional PHP development environment. The base of the stack consists of NGINX as the web server, MariaDB as the database and PHP as the scripting and programming language. 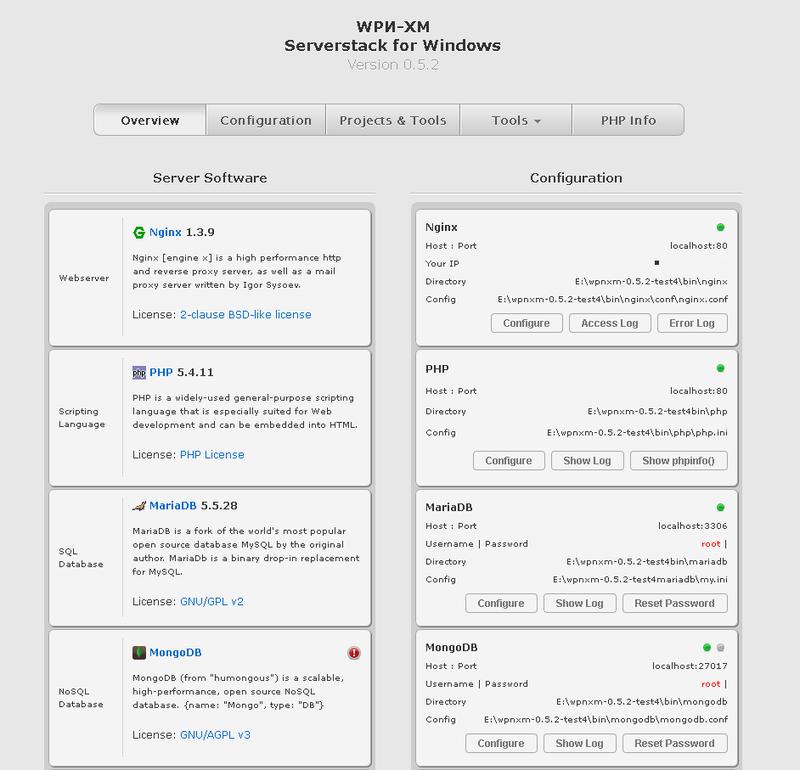 WPИ-XM provides a webinterface for server administration and a server control panel (tray application) which makes starting and stopping of servers easy. The stack includes essential utils for PHP development like Composer, Pickle, PHPUnit, phpcsfixer, PEAR out-of-the-box. XDebug and Webgrind were added for profiling and debugging purposes; phpMyAdmin and Adminer for MySQL database administration purposes; RoboMongo for NoSQL administration purposes; memcached and APCu for caching; ZeroMQ for socket magic. You will also find several additional PHP extensions. You may choose additional software packages for installation, including PostgreSQL, MongoDb, ConEmu, NodeJS & NPM, msysGit & GoGitService, Imagick, Straberry Perl. Its a modern web stack leveraging state-of-the-art components. The stack has a "Software Components Registry", which is a database of all software components provided by the project. The registry is maintained via the "Registry Updater", which allows crawling vendor websites for latest versions of their software products and updating the registry accordingly. The registry is exposed via our Web API. All software packages are also available for selective download. The project is developed on Github and actively maintained. The installation wizards are continuously integrated on Github, build on Travis-CI and released to Github Releases. WPИ-XM is open-source and MIT licensed. The following Technology is in use: Innosetup, Inno Download Plugin, Pascal, Phing, Bash, Batch, C++, Qt, PHP, HTML, JS/jQuery, upx, aria2c, Git. We use Travis-CI & Github. WPИ-XM provides 5 Installation Wizards. The Webinstaller is 2 MB of size and uses our Web API to retrieve and install the latest versions of software components. The Lite Installer ships only minimal set of components. The LiteRC Installer ships the minimal set of components, but includes the latest PHP RC version for QA and testing purposes. The Standard Installer ships components relevant for web development with PHP. The Full Installer ships our whole registry and includes Strawberry Perl & PostgreSQL. What does WPИ-XM stand for? WPИ-XM is simply an abbreviation formed from the initials of software component names. WPИ-XM is simple yet powerful. The WPИ-XM Sever Stack is an open source product. If you like it, please give us a donation. We really appreciate if you donate money, however, manpower is also needed! You're welcome to contribute to this project! Creating and maintaing a project is a lot of work. You're welcome to contribute to this project. You may help on coding, improving documentation, creating and updating translations, testing preview releases or helping other users. You can also support the project in other ways, such as adding your ideas on open issues or blogging about WPИ-XM ;-). Our source-code is located over at GitHub. Feel free to contact us and get involved in the development of WPИ-XM. Many common questions are answered at the WPИ-XM Wiki. Die nachstehenden Informationen enthalten die nach deutschen Gesetzen vorgesehenen Pflichtangaben zur Anbieterkennzeichnung, sowie wichtige rechtliche Hinweise zur Internetpräsenz des WPИ-XM Projekts : "http://www.wpn-xm.org". Anbieter dieser Internetpräsenz ist im Rechtssinne das Entwicklerteam von WPИ-XM. All products names, company names, brand names, trademarks and logos maybe the property of their respective owners.